A complicated Japanese aesthetic and cultural concept. Breaking the expression down: "Yamato" is one of the older (and thus fancier) and more poetic names for Japan and the Japanese people and culture, similar to the Celtic "Albion" for the island of Great Britain and "Éire"/"Erin" for Ireland; "Nadeshiko" is the Japanese name for Dianthus superbus, a wildflower found in the Japanese highlands that is related to the carnation (Dianthus caryophyllus). Broadly speaking then, a yamato nadeshiko is a "flower of Nipponese womanhood": a woman with attributes that were considered desirable in the neo-Confucian Japan of the nineteenth century and beyond. The term was generally ascribed to noble women with traditional upbringings, but after the formal abolishment of the caste system it passed into wider use among the new "middle classes". Being a yamato nadeshiko revolved around the Confucian concepts of Feudal Loyalty and Filial Piety, which in the latest wave of Confucian revival meant acting for the benefit of one's family and obeying and assisting authority figures (father, husband, sometimes father-in-law or older brothers, as well as older and/or more respected females). Virtues include(d) loyalty, domestic ability, wisdom, maturity, and humility. This is a Japanese ideal, so it might seem strange to westerners, but don't be fooled; the nadeshiko is a wildflower at heart. A properly done yamato nadeshiko will show a subtle, but definitely present, touch of iron, in that she is unwilling to let circumstances hurt the ones she cares about or distract her from her goals or missions. This is often accomplished so subtly that the target isn't certain how things got redirected — a subtle influence of Politeness Judo if you will. Older yamato nadeshiko are better at this, while a younger one will make up for it in determination — especially when it comes to the man she loves because that trumps everything else. Remember: this is just a trope and all Tropes Are Tools. A poorly done yamato nadeshiko, however, will turn out like an Extreme Doormat. They are silent and submissive without the inner strength of a true yamato nadeshiko. This is a common stereotype of East Asian women in Western fiction and is often referred to derisively as the China Doll stereotype. With some notable exceptions, yamato nadeshiko will be of medium height, willowy, modestly endowed, and good-looking without being too beautiful or too cute; they will have pale skin and long dark hair with full, straight bangs and sidelocks. They'll dress in feminine fashions: skirts, blouses, low-heeled shoes, lace, ribbons and simple hair ornaments. The other option is the impeccable ladylike style for adults. A kimono is likely to be worn by a nadeshiko brought up in the good old Kyoto style. Some may wear jewelry and make-up, but not too much. Their voices will often be as gentle, calm, and warm as melted butter. Large, rounded eyes are always a good bet. It is not unusual for geisha to be a yamato nadeshiko. Sometimes, these ladies will also know self-defense, even if they would rather not fight if it can be avoided. This makes sense as many nadeshiko came from samurai clans and thus were trained in fighting, so they could defend their homes whenever the males were absent. If that's the case, they'll be very graceful and effective in the battlefield, and they're likely to be White Magician Girls or Barrier Warriors. If they're neither, they'll likely use polearms, lances (specifically naginata which daughters of samurai families were traditionally trained in and included in their dowry) or bow/arrows, and maybe even small tantou daggers that may be hidden in their clothes. These characters pop up a lot in Magical Girlfriend series (usually as the one who will win the male lead's heart) and as the "Betty" in Betty and Veronica Love Triangles. They tend to be very sympathetic, but their passive, reactionary nature puts them in danger of becoming Satellite Characters for more "interesting" people, as well as a target of bashing from fans who prefer more active love interests such as Tsundere. Obviously, this trope is most popular in Japan. Expect her name to end in "-ko" [子] or "-bi", "-mi" [美], which mean "child" and "beauty", respectively.Protip "-ko" in words is analogous to the Western suffix "-ette"/"-elle"/"-ine" in making any name feminine. Less subtle examples might even use Nadeshiko for the Meaningful Name factor. You will sometimes find males who fit in the yamato nadeshiko role, personality and/or looks-wise (like Japan in Axis Powers Hetalia, obviously), but this is still rare. The true Spear Counterpart to this trope is Samurai. More information on this concept can be found in the sci.lang.japan FAQ . Compare Stepford Smiler and Yandere for a girl who seems to be a Yamato Nadeshiko but hides a far more unstable psyche. Her sort-of early Western equivalent is the Determined Widow. A more passive Victorian era Western equivalent is the "angel in the house" or as we call it, Proper Lady. An attempt to take this trope's appealing traits Up to Eleven while still playing it straight runs the risk of producing a Purity Sue. Compare English Rose and Proper Lady (her UK counterparts), Silk Hiding Steel, Spirited Young Lady, Princess Classic, Southern Belle (her US counterpart), The Ingenue, Dandere. Note: This trope is for the Japanese archetype in particular and Eastern Asian archetype in general. For the Western/European archetype, see Proper Lady. For a general 'proper on the outside, powerful on the inside' woman, use Silk Hiding Steel. For tropes describing homemakers and housewives in general, use Housewife. To describe 'innocence' or 'gentleness', use The Ingenue. Polite or friendliness can be covered by Nice Girl. For a person whose niceness belies danger/effectiveness, use Beware the Nice Ones. General girliness is covered by Girly Girl. Since Yoko Tsuno is the daughter of a very traditional Japanese family, her mother Masako is a yamato nadeshiko. The trope might have been invoked in "The Devil's Organ", when Yoko shows up to a formal party in Germany in a pink kimono and leaves everyone starstruck... then she shows the Silk Hiding Steel part by pointing at the Moebius with a rifle when her prospect love interest Vic barely averts dying from a rifle shot that almost hits him in the head. While still wearing her fancy kimono. Like mentioned above, Japan is this in Gankona, Unnachgiebig, Unità in contrast to Germany, who is a male tsundere. Let's just say Italy had guys with different personalities to choose from. In the Katawa Shoujo fanfic Weekend at Hisao's, Shizune's deceased mother is implied to have been this. Her "touch of iron" comes into play when she argues with her husband over his hiring tutors to make Shizune talk and convinces him to stop. Naruto: Game of the Year Edition has Hinata's game file have the ability to be one of these. Outside of glitches, it's only supposed to be active when she has a child and a long relationship with Naruto. Pinkie Pie explicitly uses this phrase to describe Fluttershy in Becoming Ponies. Fluttershy doesn't consider herself to be this since she's terrible with silverware. Deliberately subverted in Sonic X: Dark Chaos with Sonya the Hedgehog - she's brash, cocky, prideful, and hot-tempered (but good underneath it all). She also considers women who follow this trope to be weak helpless doormats although she has a Freudian Excuse to explain it. By contrast, Cosmo plays this trope completely straight as part of her Adaptational Badass characterization. In the Touken Ranbu Sailor Earth fic You Are My Sunshine , OC sword Nikkō Ichimonji is characterized as a gentle and attractive Miko who keeps the Citadel in order and has a Played for Laughs tendency to subtly and unknowingly manipulate others using his beautiful smile. In fact, Hasebe outright refers to him using this term twice. Barring his being a sword, his "inner steel" surfaces in his desire to be treated like a sword that is as capable of fighting as any other sword, but this isn't granted thanks to his background as an offering in a shrine and his overly kind and gentle personality. This ultimately results in a Rage Breaking Point. Hinata was referred to as Konoha's very own yamato nadeshiko incarnate before the time traveling incident that started off the events of I Am NOT Going Through Puberty Again!, her fame a result of her marriage to Naruto and her own considerable skills. In Chapter 9, though he never directly refers to the term itself, Shino muses on how easily Hinata slipped into the leadership role, manipulating both him and Kiba with terrifying efficiency in such a warm and kind manner that neither of them can really find any fault with it. Summer Wars: Grandma Sakae. Not only does she fit the build, running her extended family by traditional values, but she also wields a naginata with skill. Setsuko Hara played roles like this in the films of Yasujiro Ozu; dutiful but strong-willed loyal daughters. See Late Spring in which she played a young woman who is so devoted to taking care of her widower father that she has to be cajoled into getting married. The Twilight Samurai (a.k.a. Tasogare Seibei): Tomoe, the female romantic lead. Since the film is set in nineteenth century Japan, the trope doesn't seem out of place; if anything, Tomoe is the most "modern" major character in the film. Nevertheless, she's a convincing if not outright iconic yamato nadeshiko. Red Cliff: Xiao Qiao is the reason why Japanese Love Lin Chiling (a Taiwanese model-and-first-time actress, known for exhibiting this behavior in Real Life). In some form of distaff Hilarious in Hindsight karma, trailers for Lin Chiling's new movie Treasure Hunter have her wielding a Blade on a Stick in her first major fight scene . Sanjuro: Mutsuta's wife never raises her voice and appears to have two emotions: Happiness at pretty things and serenity at everything else. Yet aside from Sanjuro, she is one of the most intelligent characters in the film, and though Sanjuro has contempt for her, he willingly takes her advice. Ran: Lady Kaede is a villainous example of this trope. She's beautiful, gentle, graceful, mature, and the perfect lady. Also bloodthirsty, cunning, manipulative, and remorseless. She stops at nothing to avenge her family, up to and including destroying the dynasty into which she was forcefully married. Her meddling was so effective that even her own death does not prevent her goal from being completed. Throne of Blood: Lady Asaji is another villainous example from Akira Kurosawa. She barely moves during the entire first half of the film and always takes a polite tone with her husband, yet every word she says is honey laced with venom. Audition. Asami Yamazaki appears to be the sort of beautiful, demure woman that every Japanese man would love to have for a wife. However due to horrific abuse (among other things) her core of steel is made of razor wire and needles, and she's a psycho. In The Wolverine, Mariko Yashida is introduced caring for her grandfather in a family compound that values tradition (Yukio changes into a yukata when she arrives, Wolverine passes by a kendo match, etc). She demonstrates the 'core of iron' when targeted by kidnappers and confronting her evil grandfather. In The Dragon Painter, Ume-ko is a gentle soul who marries Tatsu the artist after her father, a great artist, decides that he needs to attract a protege and heir. Then, when their love gives him a case of Writer's Block because Love Makes You Uncreative, she commits suicide so Tatsu will be able to paint again. Then, when he's lost in melancholy over her death, she emerges from hiding to reveal she was Faking the Dead in order to get him painting. Samurai I: Musashi Miyamoto: Otsu, in contrast to Oko and Akemi, who are both schemers and kind of slutty to boot. Otsu faithfully waits for Matahachi while he's off at war. After he cheats on her, she pledges herself to Takezo, helping him down from the tree at great personal risk, accompanying him in flight, and promising to be loyal to him forever. Older Than Print and Discussed in The Tale of Genji. The characters come to the conclusion that a doormat is certain to snap eventually, and so it's better for a woman to tactfully but unmistakably bring up grievances with her husband and not simply take any indiscretions on his part lying down. The main character of Sawako Ariyoshi's novel The River Ki, Hana, is a well-born yamato nadeshiko born in the late 19th century. The novel starts with her marriage, whereupon she devotes herself fervently to serving her husband, his family, and their interests. She's highly cultured and graceful (also beautiful and tall), and quickly earns a reputation for tact and wisdom by serving as a matchmaker. She uses behind-the-scenes influence with great skill and energy to further her husband's political career. She's definitely strong and is compared to a river that swallows up all lesser tributaries. Hana finds this to be a fulfilling life. However, her rebellious daughter Fumio and her modern granddaughter Hanako don't share her values, and a major theme in the novel is Hana puzzling over, and partially coming to terms with, their alternate way of thinking. Hanako admires her grandmother but couldn't be her even if she wanted to: the social conditions for it don't exist in the post-war years. Tortall Universe: Given that the Yamani Isles is a Fantasy Counterpart Culture for Japan, it is no surprise that Yamani women typically are known for politeness, stoicism, and carrying weapons that look like decorations. In Shogun, Mariko Buntaro is a quiet yet very plucky woman in the service of Toranaga, who refuses her husband in private and once talked back to Toranaga himself and got away with it, despite having hit her master's Berserk Button. In the end, she throws herself on an explosive while proclaiming that this is her "honorable Seppuku" protesting their imprisonment at Ishido's hands.... forcing Ishido to free his hostages and pave the way for Toranaga to seize control of the country. This is Truth in Television as Mariko is an expy of a Real Life yamato nadeshiko: the very famous Tama "Gracia" Hosokawa. Sisterhood Series by Fern Michaels: Despite Yoko Akia referring to herself as Chinese in Weekend Warriors, Free Fall establishes her as Japanese, so she is definitely this trope. She is highly feminine, and mostly polite and soft-spoken, but make no mistake, this 4 feet 8 inches tall, 90-pound woman can and will engage in Waif-Fu if the situation calls for it. In fact, she has lost a fight on-screen and she pinned her future husband Harry Wong to the ground in a sparring match. It is telling because Harry can flatten just about anybody in a fight, and he states afterward that that was the first time in his life that he had ever been pinned to the ground. The Discworld novel Interesting Times (set in the Fantasy Counterpart Culture of Japan) essentially splits the two aspects of the Yamato Nadeshiko between two characters. The respect and obedience elements go to Twoflower's younger daughter, Lotus Blossom, while her older sister Pretty Butterfly is like most Terry Pratchett heroines, with less "a subtle touch of iron" and more "an extremely visible ton of iron". In the Yoko and Yoko & Friends series by Rosemary Wells. The titular protagonist's mother who is an anthropomorphic Japanese cat who pretty much follows this trope. Tale of Yashima: Several of the female characters, but Atsuda Manami in particular. Twice's Mina would fit into this trope because she is graceful and she is Japanese.note Expect that she doesn't wear a kimono.Because of that, some of her nicknames are "Black Swan" and "Ballerina of Tragedy". Kaguya-hime of the Japanese folktale The Tale of the Bamboo Cutter was sweet, polite, gentle and devoted to her adoptive parents. While she did ask her suitors to do impossible things as the condition to marry any of them (which meant, neither succeeded), it wasn't because of hate or cruelty, but because she had to return to the Moon at some point, to become its Queen. In BattleTech, Omiko Kurita is practically a picture perfect example of one, both from the flower of womanhood aspect, shown in her introduction in the Blood of Kerensky books, and the Silk Hiding Steel, as she fended off an assassination attempt by her lover's sister, and almost succeeded in fending off a second attempt. Cio-Cio San, the main character in Puccini's opera Madame Butterfly, is often believed to be this by Westerners... but she's actually more of a "China Doll" aka the stereotyped and racist/sexist view of East Asian women in the West , as she lacks the Silk Hiding Steel part that is needed. Therefore, she can be viewed as an example on how NOT to write a yamato nadeshiko. Cio-Cio San's equivalent, Kim, in Miss Saigon, is a better example of this trope, having a stronger personality and being a full-on Mama Bear. Ronin Galaxy: Ai is a direct example of this trope. She goes from being a naginata-wielding home defender one second, to a proper, tea pouring geisha-type the next. The YN of Contemplating Reiko is the mother of The Protagonist, Fumiko. She's the demon world version of this trope: a doting mother and House Wife whose hobbies include flower arranging, calligraphy, tea ceremony, katana wielding, drinking booze, and bounty hunting. Jade of the Ghost Blade webcomic is very nearly one of those, acting as an incidental Replacement Goldfish for her dead sister's husband. Whateley Universe example: Generator's late mother, who was even first-generation Japanese. Generator would like to become this and is trying to learn how to cook. She's already a great babysitter and wants to become a mother someday despite the fact that she was born a boy. This is the standard portrayal of the OS-tan version of Windows 95, being the oldest of the 32-bit Windows operating systems. Princess Ursa is soft-spoken, beautiful, calm and very proper, teaching Zuko about small things in the ways of life and wondering what's wrong with Azula when she's in full Creepy Child mode. She shows the core of iron by killing her father-in-law to protect young Zuko. Mai is an Aloof Dark-Haired Girl and a Lady of War, but personality-wise she's more deadpan than the standard and a lot of her apparent elegance is born out of apathy, as it was forced on her by her mother so she wouldn't "embarrass" the family. She defies none other than Azula, for the sake of the man she loves, Azula's older brother Zuko. "I love Zuko more than I fear you!". Toph can fake it perfectly, as when she shows up in a white dress in her parents' home - except she really, really dislikes it. Before leaving home she moonlights as a pro wrestler, and once she's free of her parents' supervision and can act the way she wants to, she proves to be very crude, aggressive, and unladylike indeed. The ill-fated Tang Shen, as described in Leonardo's "Tale of Master Yoshi" in Teenage Mutant Ninja Turtles (2003). The Trope Codifier would be the Chiran Nadeshiko Unit. Created by Imperial Japan in the closing stages of World War II, it was composed of middle-school and high school girls, who served as surrogate 'little sisters' providing housekeeping for the transient pilots' barracks at Chiran Airbase in Kagoshima Prefecture and taking care of the pilots for the brief periods between their arrival from training bases elsewhere and their departure on their final missions. The idea was that they would be a source of comfort and companionship to the pilots while serving as (not-so) subtle reminders of what they were sacrificing themselves to protect. The unit was highly publicized in Imperial Japan for propaganda purposes, but befriending successive waves of airmen (most of them little more than teens themselves) only to watch them sent off to die in so-called 'Kamikaze' attacks inflicted a severe psychological toll on the girls. The program finally ended after an air-raid convinced the authorities that the airfield had become too dangerous for them, though remarkably none of the girls were killed. Some surmise that the modern iteration of the yamato nadeshiko has its basis in wartime propaganda intended to buck up the home front. The full story of the Chiran girls can be found in books like BLOSSOMS IN THE WIND: Human Legacies of the Kamikaze by M.G. Sheftall, or Tokkou no Machi: Chiran by Sanae Sato. 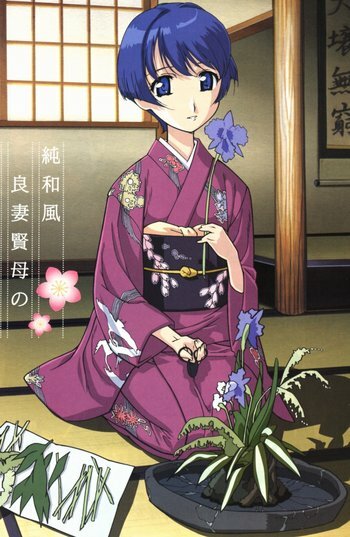 Tama "Gracia" Hosokawa , daughter of Akechi Mitsuhide. Converted to Christianity by her handmaid, she chose to die (according to some sources, she killed herself; to others, she was murdered and her killers made it look like a suicide) rather than renouncing her ideas and her family honor. In fact, the aforementioned Mariko from Shogun is an expy of Gracia. Etsu Inagaki Sugimoto was a Japanese woman of noble birth, who describes in her autobiography, Daughter of the Samurai, how she converted to Christianity and immigrated to America for an Arranged Marriage and how she maintained contacts on both sides of the Pacific into her old age. The term was the reason the Japanese female soccer team gained the Fan Nickname "Nadeshiko Japan". After winning The World Cup in 2011; the girls totally justified it! Final Kikuko Inoue count: 18.